Last month, I shared re-entry tips for students studying abroad. If you haven’t read it yet, make sure to check it out. This month, I am going to share more about the stages of emotions you’ll experience throughout your time abroad. While I didn’t realize it at the time, I can easily look back now and identify those points of time when I moved through the stages. It truly goes up and down, but I wouldn’t trade my experience for anything. Below are the stages of emotion you’ll experience and some examples from my time abroad. There are multiple versions out there, and stages might have different names, but it is all similar in what you’ll experience. Before I jump in, I want to share that I studied abroad with API so they were able to provide a safety net of sorts to help with the ups and downs of studying abroad and I’m thankful I had someone I could call if I needed something! Some of my experiences might be a little different since I had people to assist me during my time abroad. Let’s get started! For the most part, you’ll be excited and nervous. The closer your departure gets, the more nervous you’ll start to feel. I would say leading up until the night before, I was fairly excited. The biggest thing that made me nervous was knowing I would be gone for an extended period of time and would need to make sure everything was packed. Other than packing, I was still pretty excited to see and experience something new. It really starts to set in that it’s real when you go through airport security. When you first get there, everything is brand new and super exciting. I took so many pictures the first few days, because a part of our orientation was seeing several sights around London. Day 3 is when they took us on a walking tour to show us where the grocery store was and how to get to class. As at home, I was excited for my first day of class. I couldn’t fit enough into a day at this point. About a week into my time there, I hit this stage. This is where you’ll experience homesickness and miss people and things that you are used to in your life. The worst thing you can do is stay in your room. While you may not feel like it, get out and go explore. It is the best thing you can do to help get past this stage. This stage is something everyone will experience at some point. But, everyone is different, and this will happen at different times. I am a list person, and honestly, that saved me. I had a list of things I wanted to do, and continuing to take time to explore every day after class helped me move into the next stage. This stage will happen faster if you continue to get out and explore. I feel like I moved into this stage fairly quickly because I pushed myself to explore. Starting to integrate into the culture and your new home is really the starting point of feeling like a local. You are still progressing up to the next stage, but this stage was fairly short for me. The next stage is where you really start to feel like a local and you go out and see things as part of your normal life now. I got to this stage around week 3 of my time in London. I really started to feel comfortable and developed a routine for my time after class. This stage and the next stage overlap a little, so you might not be able to tell when you move from one to the next. 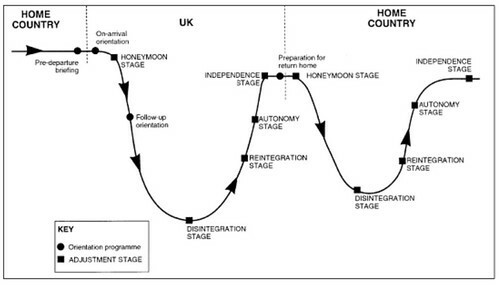 For me, this stage was most noticeable by week 4, especially knowing my time abroad was coming to an end in 2 weeks. I really tried to take everything in. You’ll know when you made it to this stage because you’ll feel like you truly live in the city and aren’t just visiting. 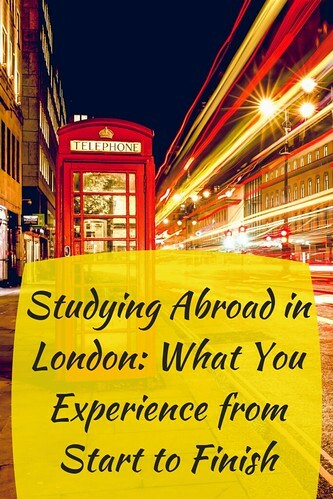 For those who study abroad for a semester or more, you will spend more time in this stage. While you enjoyed your time abroad, you will be excited to go home. You probably figured out how to adapt to things that were different, but you’ll be happy to have the little things back in life, like your favorite food. As soon as you land, you’ll transition to the next stage. The honeymoon stage also occurs when you make it back home, because you’ll be excited to have your things back. I know I really missed my bed and my dog! For me, this stage lasted a couple days. Everyone was excited to see me again, and I was happy to be home. After a few days, I ended up in this stage as life got back to normal for everyone and I tried to pick up where I left off. This stage and the next one is where my article from last month can come in handy. While your time abroad may have been life-changing for you, keep in mind that everyone else continued to live their life, and you will need to most likely get ready for your next semester of school. By using my tips from my articles here, you’ll be able to move to the reintegration stage faster. Figuring out how to talk about your experience and make an impact are the fastest ways to get this stage. I personally volunteered with our study abroad office and that helped me with my reverse culture shock. This stage won’t last forever, but it can be hard for some to cope with knowing how life used to be and the way life is now. Once you finally get back into your routine and establish new habits, you’ll be able to move into this stage. For me, this came about 2 weeks after going back to school when things started to click again. There were still moments of awkwardness because, of course, some of my friends’ lives continued while I went abroad, and things weren’t quite what I expected when I came back. But, I would say things were mostly back to normal by this point. I was starting to get back into my normal college routine. This is the final stage when you re-adjust to your new normal. You’ll always have your experience, but by this point you’ve learned how to talk about it. You know you’ve made it to this stage when things no longer seem awkward and you feel like life is normal again. This probably happens about a month after being home. It does take some time but using my tips can help speed things up for you. Understanding what you’re going through can help you move through the stages a lot faster and feel back to normal sooner. Now that we’ve walked through the stages, I hope you are still excited about your trip, but now are aware of what to expect. While living abroad really is an emotional roller coaster, think of it as a great experience you’ll have for the future and it’ll help you grow as a person. While I learned a lot while I was abroad, it was the skills I learned going through the stages that have really stuck with me.